The project was named as the seventh best summer cafe in Britain, in a recent article in The Times: ‘Alfresco Britain: The 20 best summer cafes’. Richard Murphy’s house at Hart Street was awarded the Best Single Dwelling New Build at the Saltire Society Housing Design Awards in June. We were also delighted that our project at Ravelston Dykes received a commendation in the Alterations/Renovations category. The full list of winners can be viewed on The Saltire Society website. The proposals for the development at Donaldson’s former deaf school have been submitted for planning and listed building consent. Drawings can be seen on our updated webpage. The project converts the Grade A listed Playfair building into 117 apartments for our clients City & Country and to the rear there will be a crescent of 84 new build apartments for CALA Homes. Work is anticipated to start on site early in the New Year of 2016. Our design for a new house in Morningside received planning permission in July. 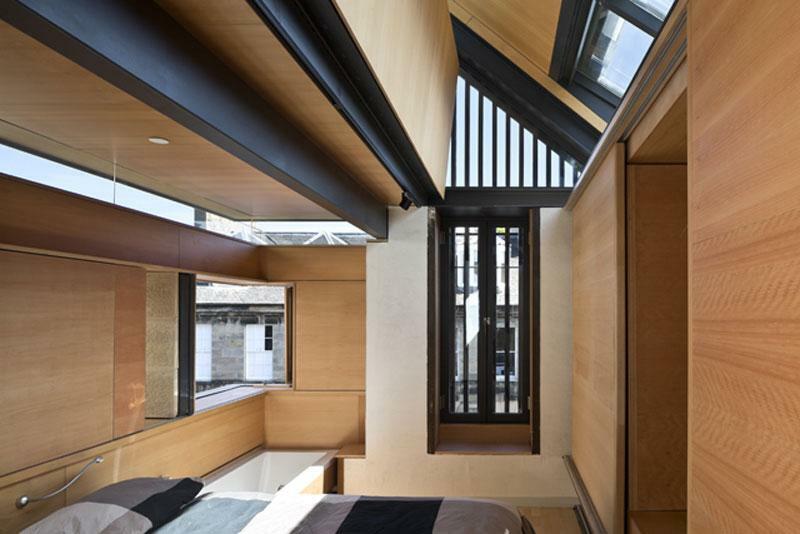 The house takes the form of a single storey courtyard house with the garden surrounded by the building. The new house will be effectively invisible from the surrounding roads as the roof level can't be seen over any of the surrounding walls. Our associates RPP Architects are currently reviewing tenders for a contractor for the Acute Mental Health Facilty in Belfast. The design for the 80 bed facility arranges the five main wards around a garden. 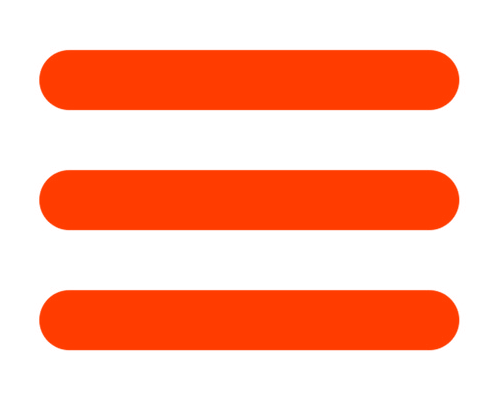 The project will be on site before the end of the year. This project for a private house on a spectacular site in Outer Dublin will be starting on site during September 2015. 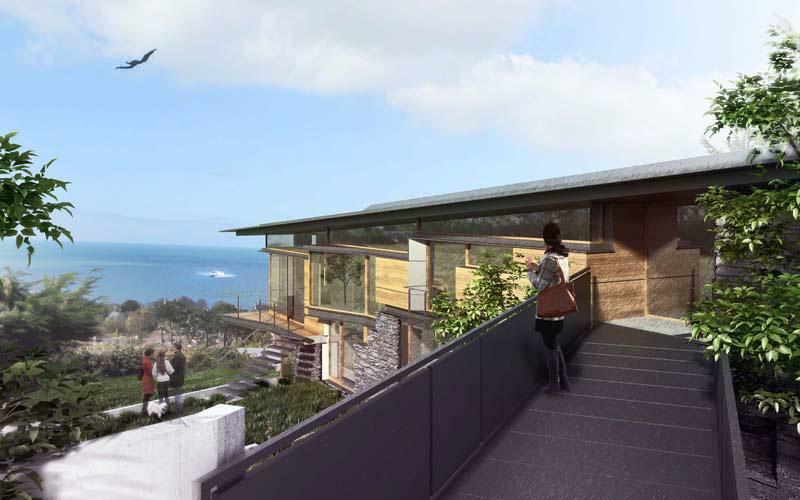 The house will be situated on a sloping site with views over Dublin Bay. The sight line, taken together with the natural fall on the site, releases a 'wedge shape' of potential accommodation - single storey to the south and double storey to the north. 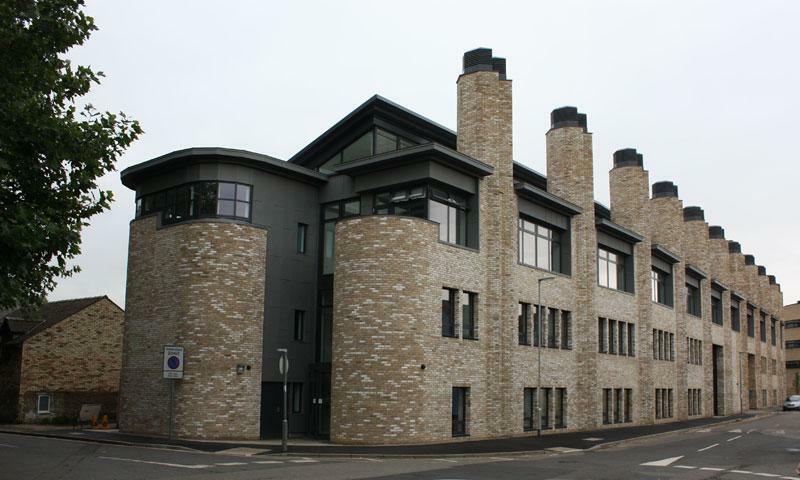 Our phase 2 & 3 works at Young Street for Anglia Ruskin University are currently being handed over to the client, with the new spaces due to be occupied by students during October 2015. These last two phases complete the Young Street campus and include a new home for the Visual Eye Research Unit, administration and general teaching space, and a new 200 seat lecture theatre as well as a dedicated café space orientated around a new landscaped courtyard space for the new campus users. 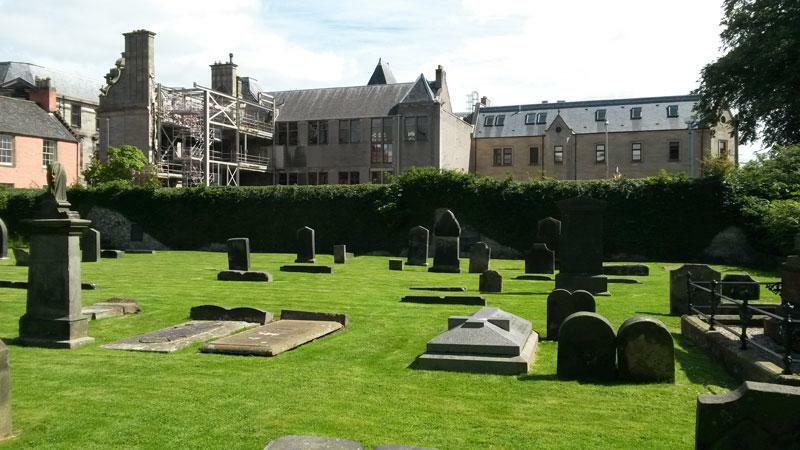 Our project in Dunfermline is in its eighth month on site. 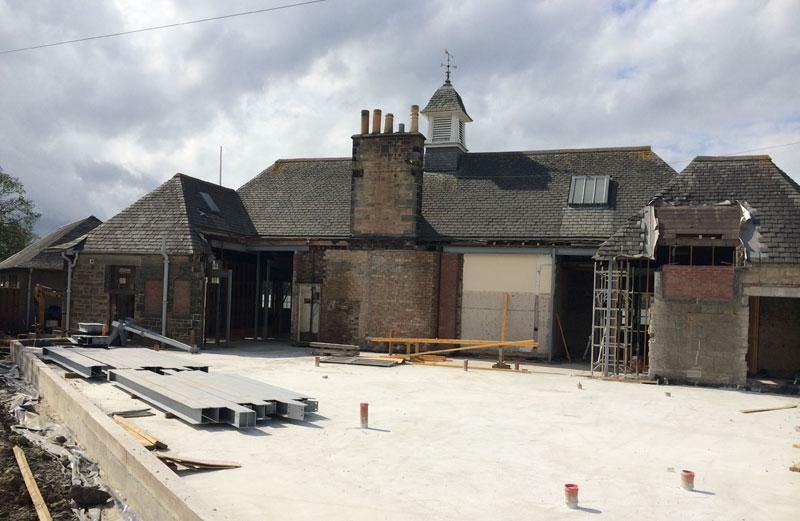 The building will now be called “Dunfermline Carnegie Library and Galleries”. The steelwork structure is now emerging from behind the retained facade of the old bank building adjacent to the Carnegie Library. The Centre for Theatre and Performance at the National University of Ireland, Galway is now on site, with completion planned in Summer 2016. 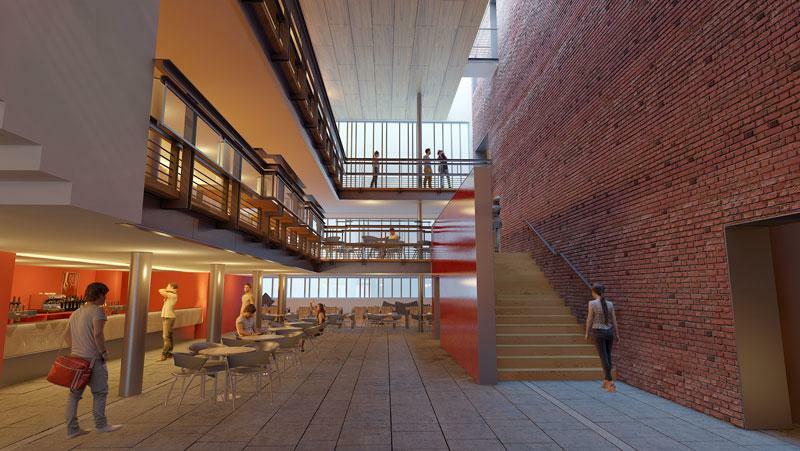 The centre will sit within Victorian industrial buildings in the heart of the campus and gives the department ambitious performance, rehearsal, seminal, workshop and administrative space. Work on the Rugby Pavilion started on site during May 2015, following completion of the Hockey Pavilion. The project encompasses works to the existing ‘main’ pavilion and the replacement of the ‘outhouse’ changing block with a new extension to the main pavilion. The new extension deliberately contrasts with the style of the main pavilion and is seen as a foil to it. Our project at Cramond is now on site and due for completion in March 2016. 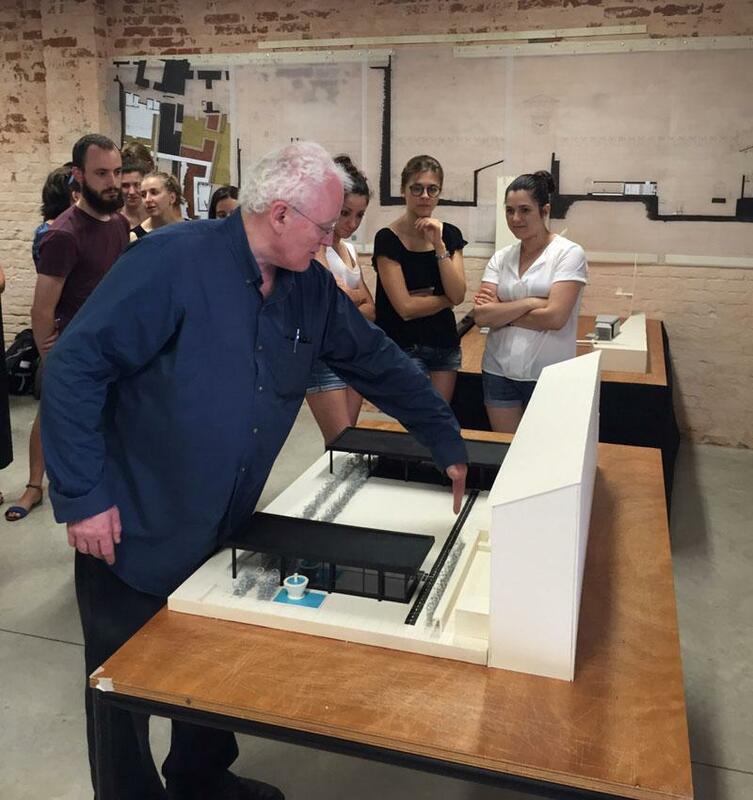 This is the last section of the prestigious Caer Amon housing development from AMA (New Town) Ltd.
A team from Richard Murphy Architects spent three weeks teaching architecture students at the Università IUAV di Venezia’s annual architecture summer school in Venice during July. 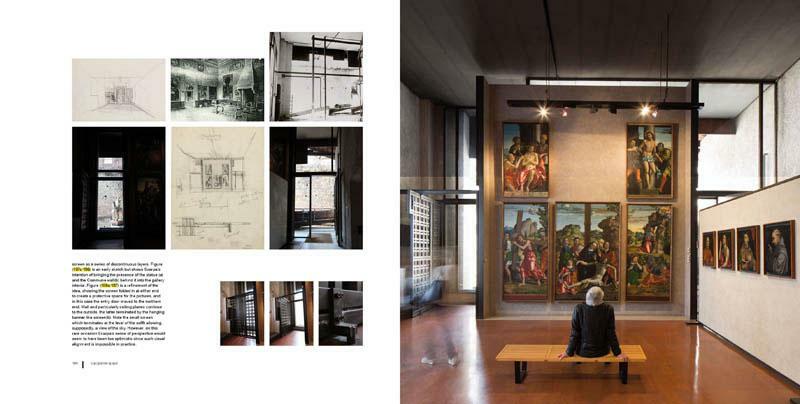 Richard is talking about the practice’s work at the Manchester Society of Architects on Thursday 17th September. The details will be advertised on the society's website shortly. On 25th September Richard is delighted to be presenting at Creative Mornings, a monthly event which takes place in cities around the world. Richard will be presenting in Edinburgh on the theme of Empathy, and will be discussing this in relation to Maggie's, and designing for healthcare in general. Richard Murphy and James Mason will be lecturing on 2nd November 2015 at the Cambridge Forum for the Construction Industry on the newly completed Young Street campus for Anglia Ruskin University. Richard will also be taking part in the Twentieth Century Society lecture series ‘My house, my practice’ in London on 26th November. Richard has also been invited to be a Keynote speaker at the Sri Lanka National Conference on 17th February 2016. 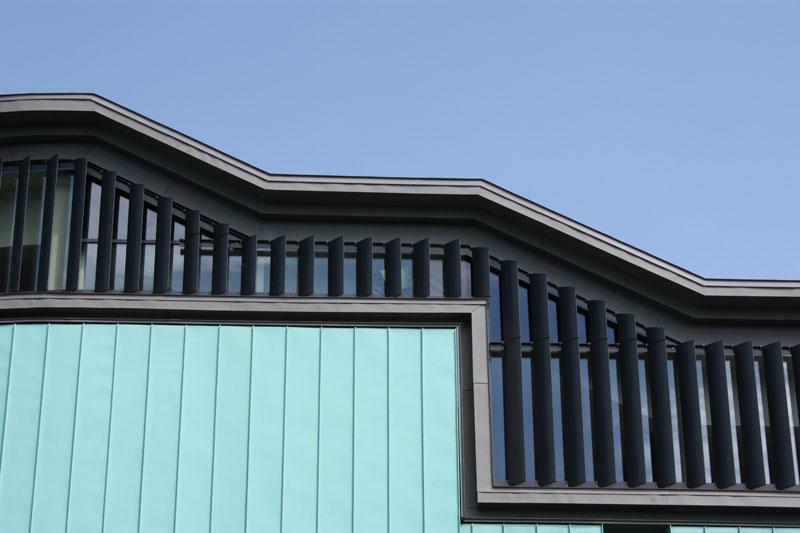 A number of our projects have featured in the press over the last few months, with the completion of the British Golf museum featuring in The Courier, Architect’s Journal and Urban Realm. The British Golf Museum also featured in ‘Alfresco Britain: The 20 best summer cafes’ from The Times. Hart Street has continued to receive attention, with features in Architecture Today (P70) and I-Build magazine, and hot off the press today, a cover feature in Homes & Interiors Scotland. The submission and subsequent approval of the planning application for Perth Theatre was covered in The Scotsman, The Courier, The Stage, Urban Realm and Scottish Construction Now.